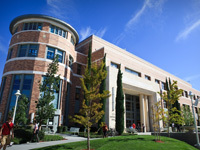 The Leatherby Libraries offer a full range of services and resources to students and faculty of Chapman University. Features include a study commons and cafe, a 60-station computer lab, 15 group study rooms, multi-media preview rooms, more than 600 seats, capacity for over 300,000 books and bound volumes as well as access to a multitude of online resources. Our knowledgeable librarians and staff are always willing to answer questions and provide personalized service to meet the needs of the Chapman community. 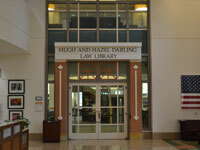 The Hugh & Hazel Darling Law Library offers a rich collection of resources and a highly-trained staff to meet the legal research needs of the Chapman community. In addition to our collection of over 300,000 books, we offer a number of specialized online databases which bring legal information right to your fingertips. Our facility seats 300 and offers wireless internet access and printing for students. We are open over 100 hours a week with librarians available for consultation for over 60 of those hours.